A while back, a classmate of mine died without any significant life insurance. He was in His early thirties, had a very young daughter, and His wife stayed at home. It was really painful to watch His entire circle of friends and family rally to organize a fundraiser so they could be provided for. The stay at home mother and her toddler were now at the mercy of their friends’ ability to host a fundraiser; that’s not ideal. I tell you that so you can be forewarned – you need life insurance if you have a spouse & kids. But knowing how much, and what kind of life insurance is extremely difficult since there’s a ton of opinions out there. That’s why we wanted to share Nuance Financial Tax & Accounting’s perspective. First off, we like what Dave Ramsey says about sticking with Term Life insurance for your needs – which is what we guide people to do. 1. We recommend insurance and protection against the things you cannot afford to lose and not insuring against petty risks. This means we insist people get life insurance, long term disability, health insurance, property & car insurance, and general liability policies. These insurances protect against things that could wreak financial devastation if faced; death, disability, car crashes, health difficulties, etc. 2. We recommend working out what your ideal amount of insurance benefit should be, then cross referencing that with your budget and affordability. If your family ever needs to use your life insurance, they will be very happy it was well thought out. 3. We recommend that everyone put together a basic will, which is a document to ensure that your heirs understand your desire for your estate. 4. We recommend spending the money to perform estate planning ahead of time if you have more assets than debt. For assets with a named beneficiary, such as retirement accounts, life insurance, and annuities; the assets will avoid probate (but check for the estate taxes). Probate is a process in which a probate attorney works with the courts to allow an estate’s creditors an opportunity to collect debts if necessary. Probate is expensive, annoying, and often worth the nominal cost to avoid for your heirs. It’s because of that, we highly recommend sitting down with a good estate planning attorney to get you setup. Paying $1,000 – $3,000 for estate planning makes sense if you have children, grandchildren, and more assets than debts. Estate planning is particularly helpful if you have any land, businesses, or other valuable non-traditional assets. So that’s the top level advice we have, so how much death benefit should you get for your term life insurance? Again, we recommend that you ignore your budget at first and find out what the perfect or ideal amount of protection would be if cost were not a factor. In other words, work to find your true liability amount, and then back into a term life insurance that is affordable for you. After you come up with that, you can apply for the larger amount and then mix and match term length and death benefit to fit your actual affordability after you’ve gone through underwriting. In short, go through underwriting for the most you’d ever need, and then dial it in after you are approved. 4. It should provide whatever income stream is needed after paying off all the debt and providing a 6 month cash buffer – USING A 4.5% drawdown rate. The most important consideration is that your family will need income – no matter what. When you take all that into account, you might find out that you show a high death benefit need. Remember, this is just an ideal “liability” amount for your case and going through the underwriting process will determine your offerings and premiums. 2. Figure out what annual income should be provided after those debts are paid, and divide that amount by the withdrawal rate of 4.5% (.045). For example, if you needed to provide about $40,000 a year of income to your family, you would divide $40,000 by .045, giving you a figure of $888,888 in death benefit. 5. Add in college funds if you desire. This method means that a person might see the need for $1,000,000 to $3,000,000 life insurance death benefit. This might seem astronomical, but I assure you that it’s just part of being a responsible parent, spouse, or grandparent. I usually recommend working with an independent insurance broker who can shop the market to get quotes from multiple companies so you can get competitive offers. The other thing I recommend is going through underwriting for a high death benefit amount, then mixing and matching term lengths with death benefit amounts to find the premium that solves your problem and is affordable. Remember, the best life insurance contract available is the one that’s in place when it’s needed. This means you need to be able to pay those premiums while you still have an insurance need. 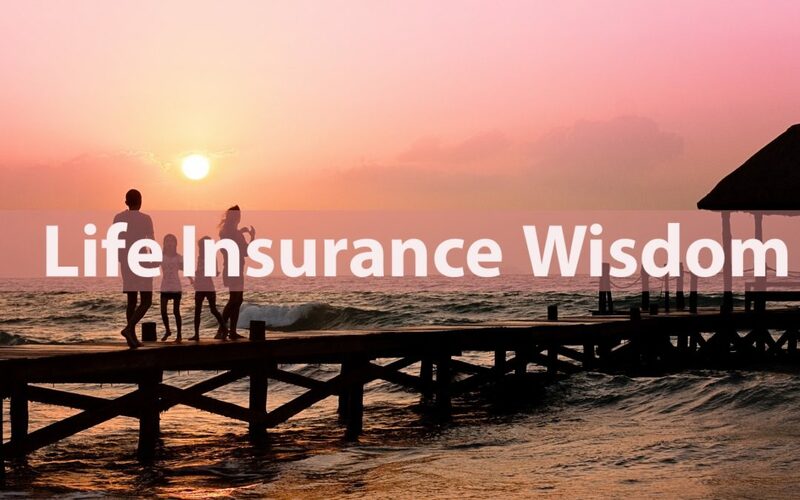 Now that I’ve covered how to make some wise life insurance decisions, Here are 4 mistakes when it comes to life insurance. 1- Be willing to gamble that you won’t die unexpectedly. It shouldn’t be up to you whether you have life insurance; it should be up to those who depend on you. Even if you’re the “bread winner”, it’s most important to talk with your spouse and have a real conversation about what life could, or should, look like if you pass away. If you have ANYONE relying on your income or support in ANY form, you should make sure you have some economically sensible, term, life insurance. If you don’t realize the economic value of your life, career, influence and support – you’ve been deceived. Your life is valuable to the loved ones around you, not just in sentimental & relational ways, but also in the economic sense. Don’t be silly, you have no idea when you will die. I’ve heard husbands say this and I shake my head every time. You’re spouse should be given the dignity to ease into being a widow or widower rather than being thrust into requiring a new financial supporter. Deciding that your insurance need is really small because you’re spouse is good looking, young, and should be able to “marry up” is ludicrous. Life insurance does an amazing thing by giving a surviving spouse the dignity of financial independence after their loved one is gone. Don’t be flippant with the ramifications of death. Life insurance death benefits should be about giving financial independence to your survivors – which ultimately means replacing your income or economic equivalent. If you don’t do the math to provide income to your family after you’ve passed away, then you’ve been unwise. 4- You’ve Forgotten that your kids need MORE focused time with the surviving spouse. This is my biggest realization about life insurance. When a parent passes away prematurely, the children need the surviving parent more than ever. There’s no reason why a widow or widower should be stuck working doubles & long shifts to pay the bills simply because there wasn’t life insurance. Protect your family with life insurance if you haven’t already.